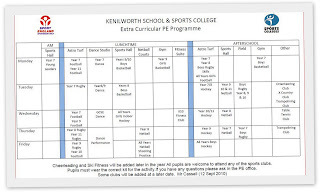 Here are all the Kenilworth School and Sports College before school, lunchtime and after school Clubs for 2010-11. This table appeared in the first school newsletter on 10th September 2010. Everyone from Year 7, 8, 9, 10 and 11 has the opportunity to enjoy: Basketball, Dance, Fitness, Football, Hockey, Orienteering, Netball, Rugby, Table Tennis, Trampolining, X Country and Young Leaders. 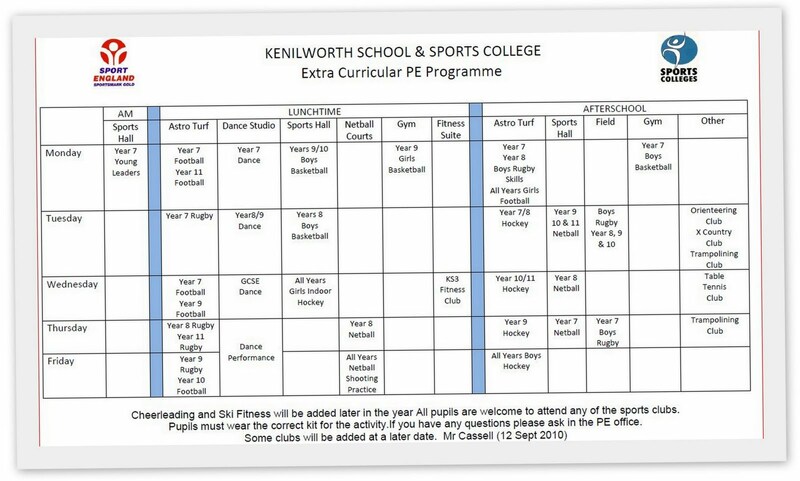 Mr Cassell tells us, 'Cheerleading and Ski Fitness will be added later in the year All pupils are welcome to attend any of the sports clubs. Pupils must wear the correct kit for the activity.If you have any questions please ask in the PE office. Some clubs will be added at a later date'.